Are you living off of someone else's blueprint? Wearing someone else's clothes? Living someone else's life? 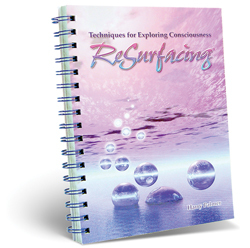 Don't answer until you have worked your way through the 30 consciousness expanding exercises in this book. ReSurfacing refers to the action of disentangling yourself from old creations and rising back into awareness. It is a process of revealing your self to yourself. The reward is discovering why your life works—or why it doesn't. Without a doubt, you will be surprised and amazed to discover the source called "You." This is the best book I've ever read for personal transformation. It contains very simple exercises and tools that can be done solo or with a group that have made a major difference to the quality of my life. I can pull out one of the exercises to regain control when I'm feeling overwhelmed/stressed out at work. I can use others to simply still my mind. I've used them to shift my perspective on painful experiences - both past and present. I've used them to look at feelings, beliefs, and memories in a different way, to see them from another's perspective, and not to be controlled by the emotions they have usually generated. I've learned thorugh this book to easily slip into an observer's point of view, and then to move into a more universal perspective. The results I've achieved since reading the book in April 99 are life-changing, and I continue to get more out of them every time I use them. I would recommend this book for any use in your personal or working life. I can't begin to explain how wonderful the book is. I can only recommend that you buy it and try it for yourself! the miracle is that there is a universe within life. the miracle is that the universe evolved out of consciousness. the miracle is that you contain a here/now. Oh, my ancient companions, wake from your long sleep. There is so much I have to show you. English, Albanian, Chinese-Simplified, Chinese-Traditional, Czech, Farsi, French, Hebrew, Icelandic, Italian, Japanese, Norwegian, Polish, Portuguese-BR, Russian, Slovenian, and Spanish.